We provide vegetarian only menus from thousands of restaurants across the country. We strip out the meat dishes so veggie eaters dont have to waste their time going through the menu. We list menus whereas a lot of our competition does not! Because of this we are the premier choice. 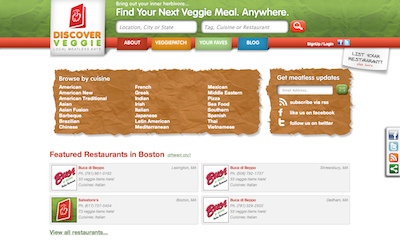 In addition, we have yelp.com reviews integrated on our site and restaurant.com discounts for each restaurant.